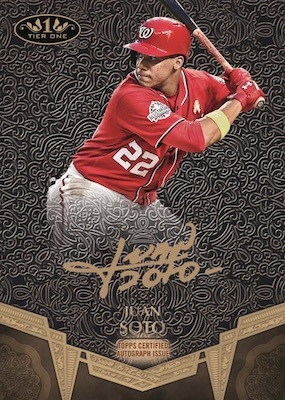 2019 Topps Tier One Baseball again maintains a high bar for MLB hits. Each Hobby-only box contains two autographs and one relic card. Similar to 2018, on-card autographs are a focus for the brand, with a few new options rolled in. 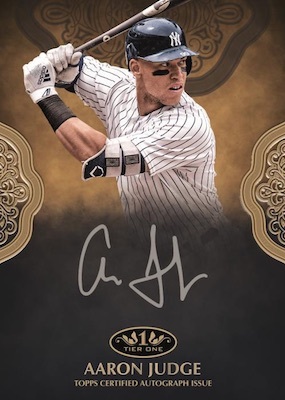 Lacking a true base set, the 2019 Topps Tier One Baseball checklist offers multiple autograph lines, each with a different theme. The hard-signed Break Out Autographs covers rising stars at 299 copies or less, adding Bronze Ink (#/25), Silver Ink (#/10) and Gold Ink (1/1) parallels. Also matching the main print run of 299 or less and low-numbered ink parallels, Prime Performers Autographs features past and present stars, and Tier One Talent Autographs highlights the standouts of various aspects of the game, like power, speed or pitching. The namesake Tier One Autograph line is a case-hit that promises some of the key MLB names of today and yesterday. These cards have Bronze Ink (#/25), Silver Ink (#/10) and Gold Ink (1/1) parallels. Among the more limited choices, the acetate Clear One Autograph and new Clear One Dual Autograph sets are both hard-signed and capped at 10 copies or less. There are also Dual Autographs (#/25 or less), Triple Autographs (#/10 or less) and Cut Signatures (1/1) cards to track down. Working in a mix of memorabilia, many of the auto relics in 2019 Topps Tier One Baseball are impressive. Numbered to 100 or less, the Autographed Tier One Relics cards also come in Dual Relic Patch (#/10) and Triple Relic Patch (1/1) form. The Dual Autograph Tier One Relic Book set features a Dual Patch (1/1) version, as well. Autographed Prodigious Patches makes good use of a premium game-worn swatch. Each card is number to 10 or less with a one-of-one Platinum parallel. 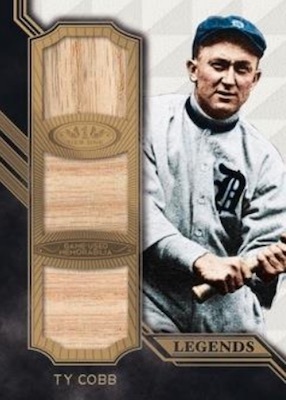 The 2019 Topps Tier One Baseball chase really gets going with the game-used, one-of-one Tier One Autographed Bat Knobs, Tier One Autographed Limited Lumber and Cut Signature Relics. Continuing a different sort of relic offering, the Signature Tools Autograph Relics cards contain part of the actual pen used in the signing process. 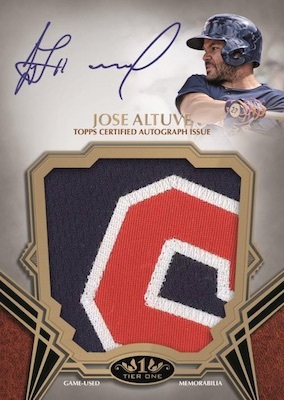 In addition, collectors can try their luck pulling one-of-one Tier One All-Star Patches Autographs or Tier One Uniform Button Relics Autographs. 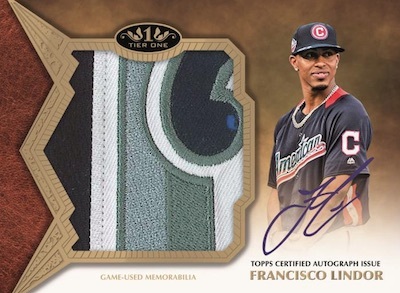 Falling one per three-card box, 2019 Topps Tier One Baseball showcases multiple relic inserts. The most common are the numbered Tier One Relics and Tier One Legends Relics cards. Both have Dual Relic (#/25) and Triple Relic (1/1) parallels. The all-new Tier One Uniform Button Relics set has five copies or less with an embedded jersey button in each card. Another jumbo relic set, Prodigious Patches keeps print runs no higher than 10. More one-of-one editions include Tier One All-Star Patches, which has a jumbo piece from the 2018 All-Star workout jersey, as well as Tier One Bat Knobs and Tier One Limited Lumber. JIM THOME 2018 TOPPS TIER ONE AUTOGRAPH AUTO #103 130 -INDIANS!! !